"Work expands so as to fill the time available for its completion“, says Parkinson's law (C. Northcote Parkinson, 1955). Everyone knows cases in which this doctrine applies to project management. At the beginning of a project, there is plenty of buffer time for all the project stages, so that the project team doesn’t fall behind and is able to deliver results to the customer in time. Towards the end of the project, things tend to get really stressful and meeting the project objectives is jeopardized. There are loads of projects which are finished far behind schedule. But how can that happen if there is generous buffer time for unexpected developments during the project? 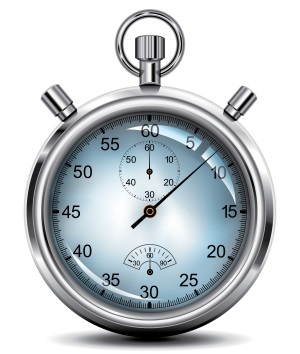 In many projects, buffer time amounts to more than half of the entire project time. And why is estimating times and dates in a project such a difficult thing to do? In most cases, several psychological factors are involved if serious planning errors happen. At the beginning, more often than not there is a generous time frame for a project. Many estimated values of a project already include buffer time. Additionally, each department adds its own buffer time to the project. That is only human, as the person in charge has to take the responsibility if there is a time lag in their own sub-project. There is a tendency towards pessimistic estimated values rather than optimistic estimations in projects. Time and effort for activities are sometimes willingly overestimated, because they fear that team members from higher hierarchy levels will discard a considerable part of the buffer time anyway. This generous time frame in particular leads to a phenomenon in project teams that is known as student syndrome or procrastination. The time that is available for the project is completely used up. Especially at the beginning of the project, team members dawdle – it is still enough time to finish all work packages in schedule. Decisions are delayed, many alternative solutions are discussed, tasks are not entirely completed and external project partners are held in standby position. People act that way for many reasons. Sometimes it is just laziness – why work as quickly as possible if it possible to do the job sluggishly? People and organizations tend to make incorrect assumptions when it comes to the time they need to complete a task. Studies show that especially managers overestimate their own efficiency. Only when they are supposed to estimate how much time other people might need to fulfill a certain tasks, the evaluation is more realistic. In large projects, the project goals are often extended during the project (“mission creep”) which leads to further delays. And presto: The buffer time which appeared to be so generous at the beginning of the project has vanished into thin air and there’s an exponential increase in project time needed and the project costs. If project managers then try to save the project by shifting more staff to it they often cause further delays (the so-called Brook’s law according to Frederick P. Brooks). The myth of buffer time in projects - Part 1 - InLoox • Copyright 1999-2019 © InLoox, Inc. All rights reserved.